LG's upcoming G Pad Android tablet is now rumored to feature the Snapdragon 600 processor, while previous leaks mentioned the Snapdragon 800. 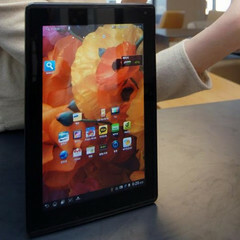 Also known as the V500, LG's upcoming G Pad tablet is getting closer to its unveiling. Previous rumors mentioned a Snapdragon 800 processor and a screen size of 9.8-inch, next to an impressive resolution of 1,920X1,200 pixels. The WiFi variant will be built for the Korean Market, while the other will be sold in the United States. The same official sources mentioned Verizon Mobile as the first US mobile carrier to receive the LG G Pad. Unfortunately, the date of this event is unknown. Regarding the unveiling of the LG G Pad, all the previous rumors have been confirmed once again - the 8.3-inch Android tablet is expected to be shown next month in Berlin at IFA 2013.